When a person is missing one or more teeth, it may be difficult to determine which is the best treatment to restore your smile. At Studio City Dental Group, we provide dental implants to comprehensively renew an individual’s dental anatomy even after a tooth is lost. All of our dentists have years of experience in rejuvenating the smiles of those in Playa del Rey and its surrounding communities. If you are looking to restore your missing teeth with a dental team that puts your comfort and needs first, contact our dental office today. Our dentists are eager to help you down the path to improved oral health and aesthetic. A dental implant is made up of three components: the post, the abutment, and the restoration. One of our dentists places the implant post into the jawbone to provide a secure foundation for the restoration. Leaving an empty space unaddressed allows neighboring teeth to shift into the void, causing misalignment. Resorption is another complication that may occur due to a lack of stimulation from the tooth root to the jawbone. The resorption process is when adjacent bone begins to atrophy, and because of this a person may appear prematurely aged as their facial structures look shrunken. e their lost tooth, they must first have their dental anatomy examined by one of our skilled dentists. This is to make sure your oral health good enough to undergo the placement procedure and minimizes chances for dental implant failure. There are four stages of implant treatment: consultation, placement, healing, and the restoration. The consultation is when dental images are taken of your smile to determine the optimal location of your implant posts. After the placement procedure, which is inserting the implant into the jawbone, you must give surrounding hard tissues a significant amount of time to recover from the surgery. 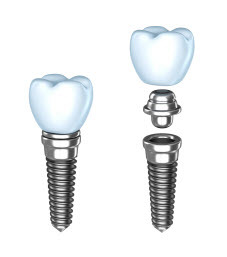 Once your bone has healed, a crown or other type of prosthetic is affixed to the dental implant, allowing you to regain complete dental function and bite strength. At Studio City Dental Group, we only provide visually appealing restorations that can seamlessly blend in with surrounding teeth. Our prosthetics are strong and resilient, keeping their sheen and remaining durable enough to sustain everyday tasks. If you would like to learn more about dental implants and how they can help you regain dental function and oral health, contact Studio City Dental Group today! Our Playa del Rey dentists and the rest of our staff do everything they can to help you go about your daily life as usual. Contact our dental practice today to schedule a consultation!